Secretary-General António Guterres addresses an event on the occasion of the World Day Against the Death Penalty on 10 October 2017. On his right is Andrew Gilmour, Assistant Secretary-General for Human Rights. The death penalty does little to deter crimes or serve victims, United Nations Secretary-General António Guterres said on Tuesday, calling on all countries which have not forbidden the extreme practice to urgently stop executions. “The death penalty has no place in the 21st century,” underscored Mr. Guterres, speaking alongside Andrew Gilmour, Assistant Secretary-General for Human Rights, at an event at the UN Headquarters, in New York. Welcoming that some 170 States around the world have either abolished the death penalty and put a moratorium on its use – most recently, Gambia and Madagascar – and that executions in 2016 were down 37 per cent compared in 2015, the UN chief, however, added that at present just four countries accounted for 87 per cent of all recorded executions. He also expressed concern that the countries that countries that continue executions are also failing to meet their international obligations, particular in relation to transparency and compliance with international human rights standards. “Some governments conceal executions and enforce an elaborate system of secrecy to hide who is on death row, and why,” noted Mr. Guterres, underscoring that lack of transparency showed a lack of respect for the human rights of those sentenced to death and to their families, as well as damaging administration of justice more generally. Also today, the Office of the UN High Commissioner for Human Rights (OHCHR) also called on all countries to strengthen efforts to abolish the death penalty. “We […] call on all States to ratify the Second Optional Protocol to the International Covenant on Civil and Political Rights,” said Rupert Colville, a spokesperson for OHCHR, told journalists at a regular news briefing in Geneva. The Second Optional Protocol to the International Covenant on Civil and Political Rights (ICCPR), now ratified by 85 States around the globe, requires its parties to abolish death penalty. It is the only universal international legal instrument that aims to end the practice. “[OHCHR] stands ready to continue to support all efforts in this direction,” he added. 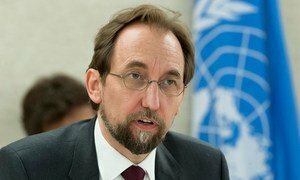 The mass hanging of 42 prisoners on Sunday in a prison in southern Iraq raises massive concerns over the country's use of the death penalty, the UN human rights chief said Wednesday.